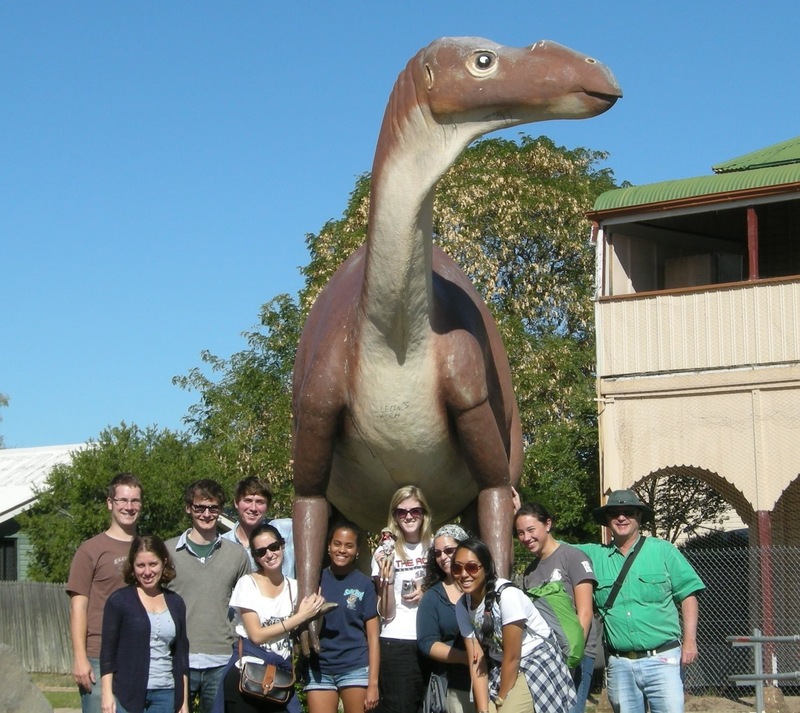 Emory science majors pose with a life-sized statue of Muttaburrasaurus langdoni while crusing the Cretaceous of Queensland. Can you spot Paleontologist Barbie in this picture? You may have to click on the photo to enlarge it. Photo by Anthony Martin. A dozen years ago, Australian rancher David Elliott came across a large bone while rounding up his sheep in the Queensland Outback. It turned out to be the femur of an 18-meter long sauropod – a piece of the largest dinosaur ever found in Australia. The collecting bug bit Elliot, as more dinosaur fossils were dug up on his property. He and his wife, Judy, founded the Australian Age of Dinosaurs Center (AAOD) in Winton. The isolated Outback town, where poet Banjo Patterson wrote the classic tune “Waltzing Matilda,” is now a hub for dino tourism. Martin and geologist Steve Henderson of Emory’s Oxford College recently returned from leading nine students on a summer study abroad program in Australia. A highlight was a whirlwind paleo-tour of Queensland, including a stop at the AAOD. Unlike the American West, which has a 100-year history of unearthing and studying dinosaur fossils, Queensland is at the beginning of uncovering a rich trove of the prehistoric past. “You get to see the science as it's happening and feel the immediacy of discoveries,” Martin says. Read more about Down Under dinosaurs on Martin's blog The Great Cretaceous Walk.